The unique, and might we say, bold flavour of garlic could transform any food into a flavoursome one. Garlic is widely known for the presence of the sulfur compound namely allicin. In fact, a little-known fact about this root is that the sulfur compound can help improve iron metabolism. Researchers have called garlic a ‘seleniferous’ plant because it is a rich source of selenium. We have merged this extremely flavourful root in the traditional rasam to yield garlic rasam. Totally try worthy! In a kadai, pour the lentil water and boil it. Dry grind whole black pepper and the garlic clove. In a separate pan add olive oil and add the crushed mustard, whole red chili, crushed pepper, curry leaves, crushed pepper, crushed garlic. Add the tomatoes to it and add it to the boiling lentil water. Soak tamarind in hot water for 15-20 minutes. 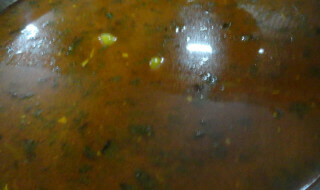 Add the tamarind pulp to the rasam. Add salt and garnish it with coriander leaves.